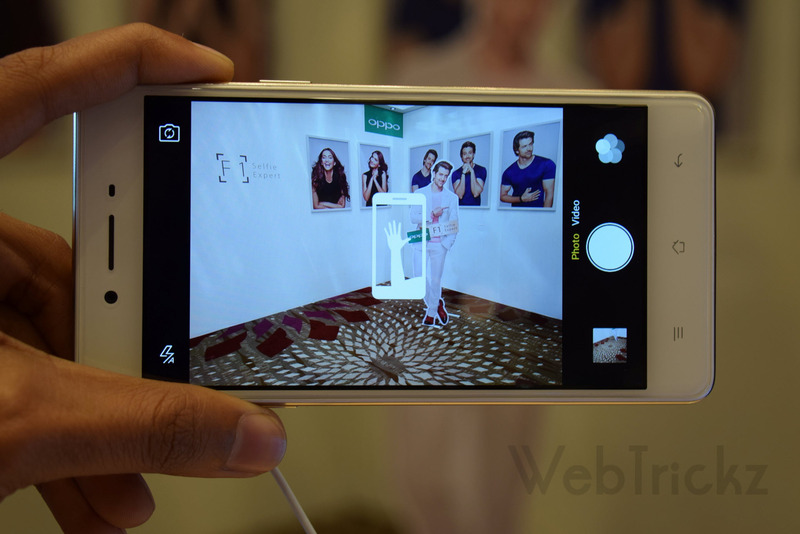 At the OPPO event in Mumbai yesterday, we witnessed the launch of Oppo F1 dubbed as ‘Selfie Expert’. 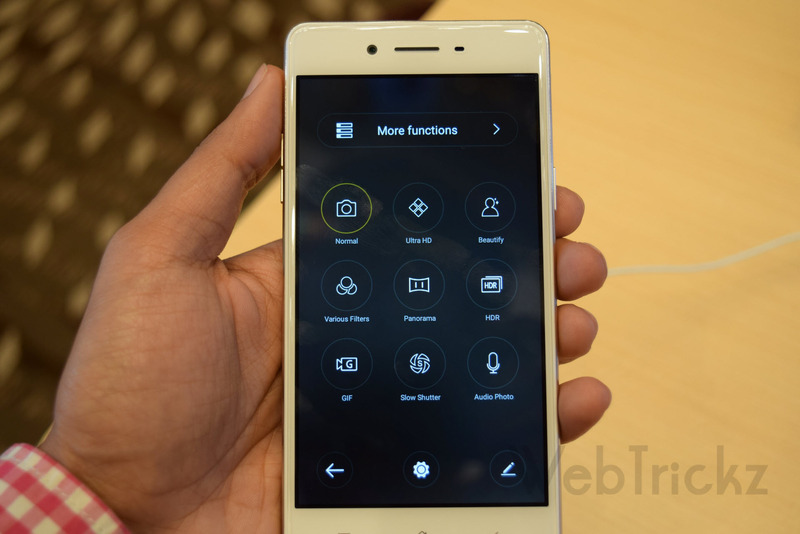 The F1 was announced recently at CES 2016 and is now launched in India at a price of Rs. 15,990. 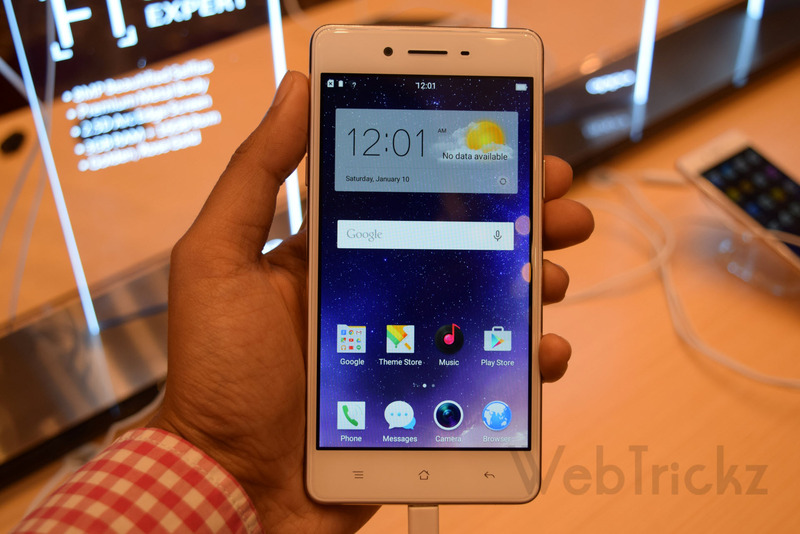 An upgraded version of F1, the F1 Plus was also revealed that will be available later in April for 26,990 INR. We got to try out F1 briefly at the event and are here to share our first impressions. The OPPO F1 comes in a sleek and compact form factor featuring a premium metal unibody design. The metal alloy is of fine quality that feels soft to touch and looks aesthetically beautiful. Talking about the hardware, F1 sports a 5-inch HD display with 2.5D Corning Gorilla Glass 4 that offers better protection and is less prone to scratches. The streamlined micro-arc edge surrounding the phone and rounded corners makes it even more comfortable to use and gives a velvety feel in hands. We feel the F1 truly scores high brave points in the design and look department. The front in white color is common for both the color options and blends well with golden and rose gold. 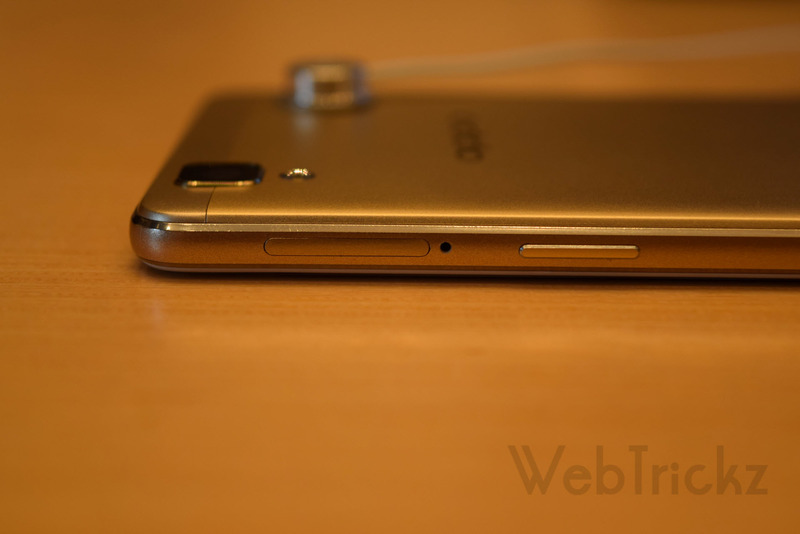 You can spot the front camera, earpiece, notification LED and the sensors on the front followed by 3 capacitive keys that aren’t backlit unfortunately. The right side of the phone houses the power key and a hybrid SIM tray that accepts dual SIM (micro SIM + nano SIM card or a microSD card). 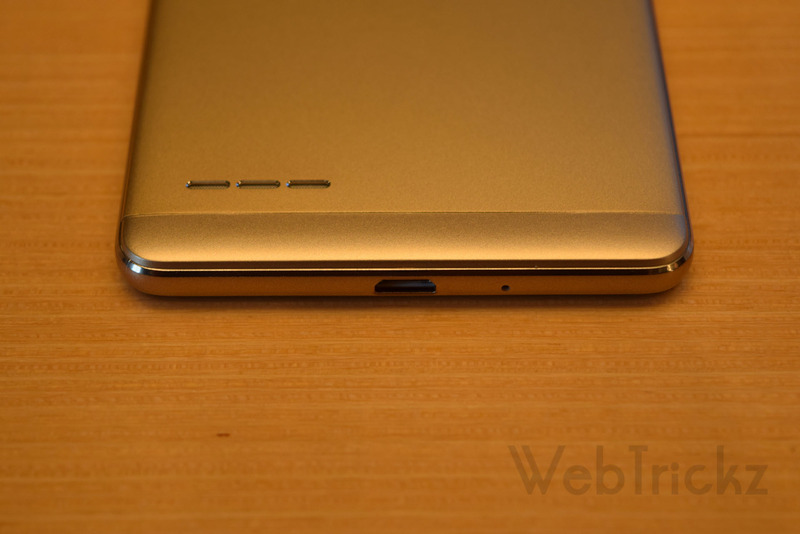 The metallic volume keys are placed on the left side, the top holds 3.5mm audio jack and the micro USB port is at the bottom. 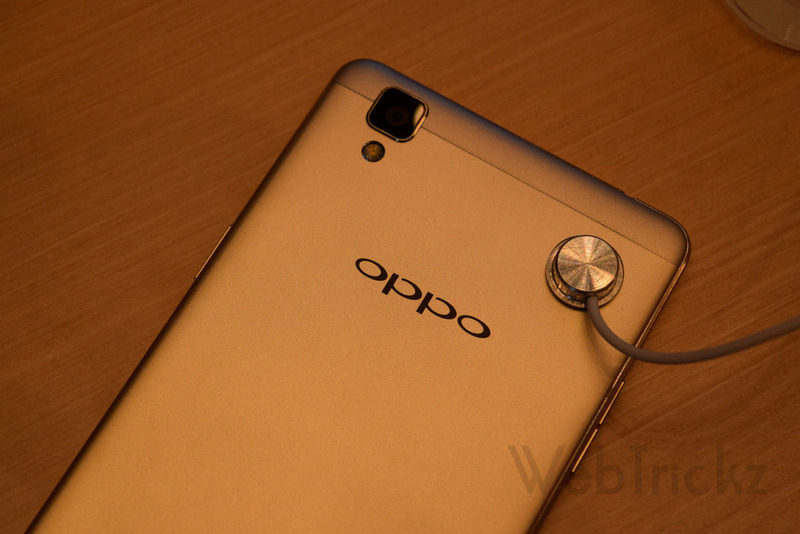 Coming to the back, there is a 13MP camera with single LED flash and right below flaunts the OPPO branding followed by a 3 grill speaker at the bottom left. F1 comes with a 5″ HD display that looks good and vivid but we wish it had a FHD screen. 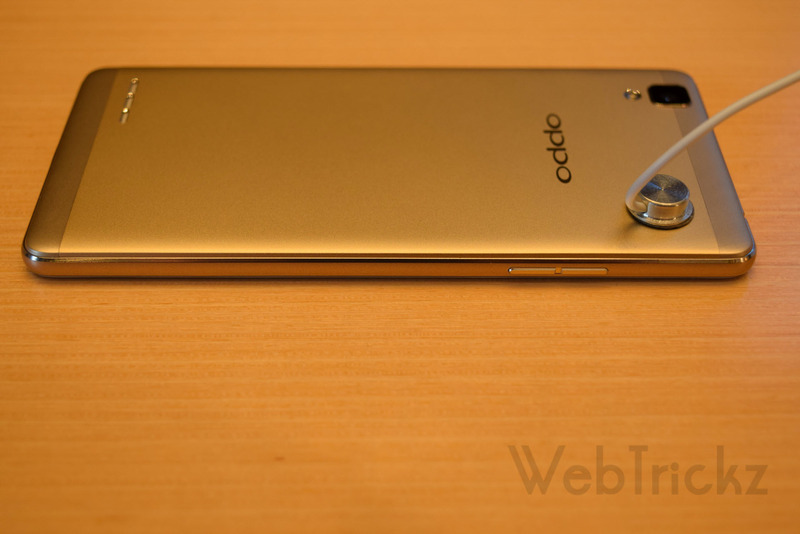 The device is powered by Qualcomm Snapdragon 616 Octa-core processor clocked at 1.7GHz, Adreno 405 GPU and 3GB of RAM. It runs on the proprietary Colors OS 2.1 based on Android Lollipop 5.1.1. There is 16GB of storage available on board that can be further expanded upto 128GB but for that one has to sacrifice the Dual SIM functionality. F1 also supports VoLTE (Voice over LTE), beneficial for users on Reliance Jio 4G network and OTG support is included too. The Camera plays a significant role on F1 as it’s a camera centric phone, selfie-centric to be precise. 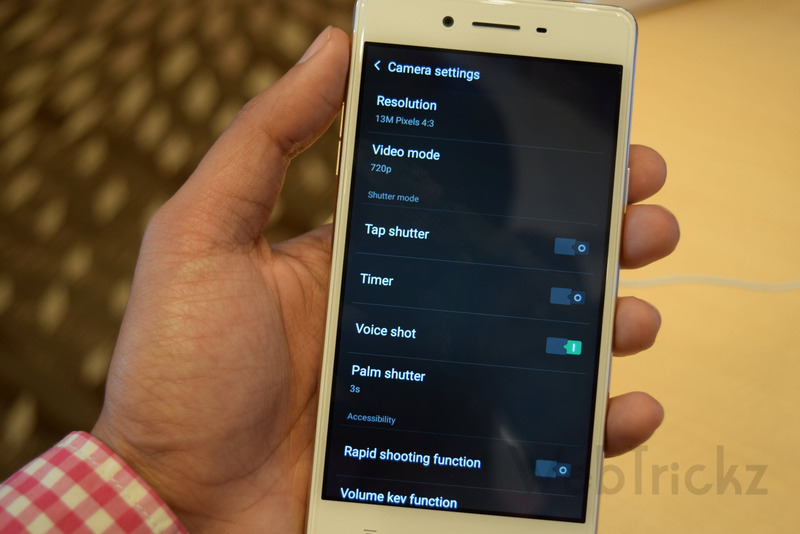 It packs a 13MP primary camera with f/2.2 aperture, phase detection autofocus (PDAF), anti-shake optimization and a 8MP front-facing camera with f/2.0. The camera packs a punch and comes with a variety of advanced shooting modes for capturing pro shots. Some of these include: Ultra HD, Beautify, Slow shutter, Double exposure, Super Macro, Time-lapse and Slow motion. Beautify 3.0 has 3 beauty modes for selfie lovers and ‘Screen flash’ ensures bright selfies in low-light conditions. The key highlight here is the ‘Ultra HD’ mode that is capable of shooting 50MP photos and F1 has the ability to store photos in RAW format for post-processing, a feature aimed towards pro photographers. 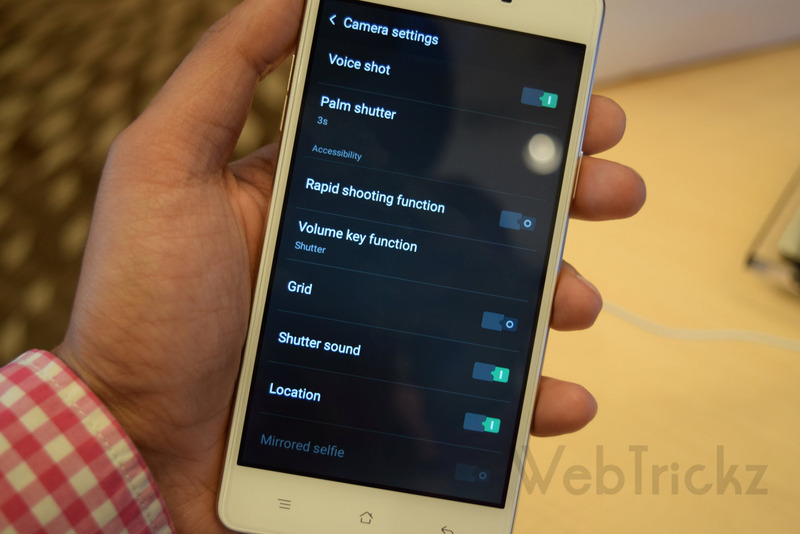 Moreover, there are 8 live color filters and an ‘Expert mode’ that offers manual functions for advanced users. One can take selfies with the gesture of palm or through voice commands. 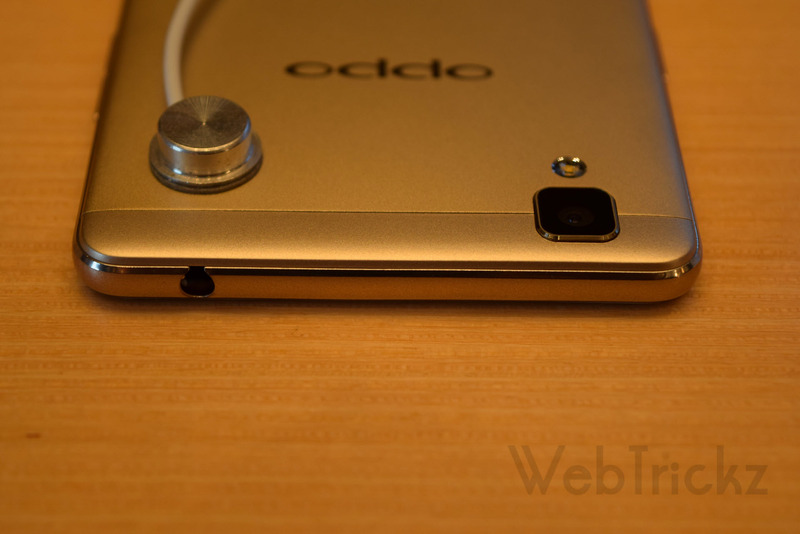 During our short duration with the device, we found the camera to be pretty impressive. The device comes in 2 gorgeous colors – Golden and Rose Gold. 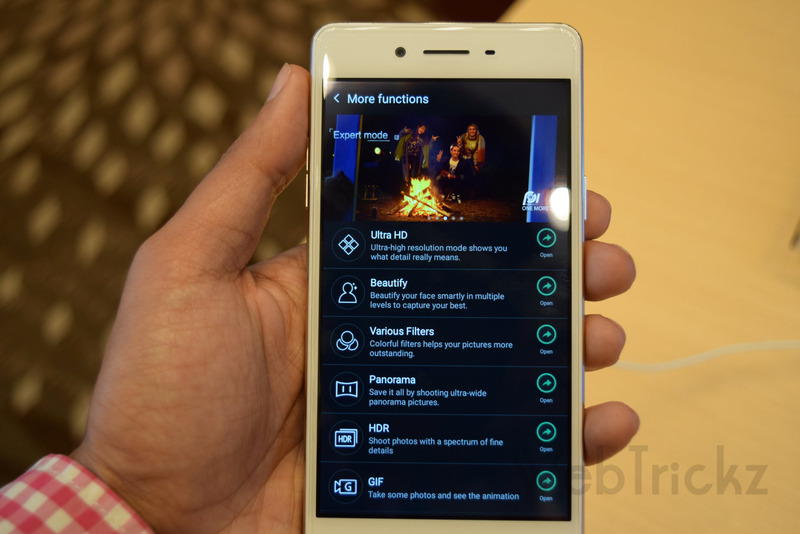 OPPO F1 clearly focuses on a premium design and rich camera experience. 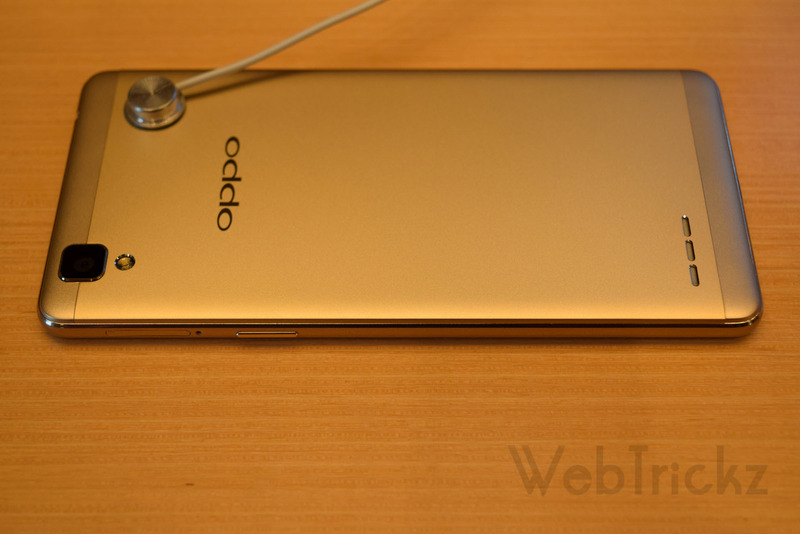 The device looks a tad low when comparing the specs with competition, blame its 720p HD display and 2500mAh battery. 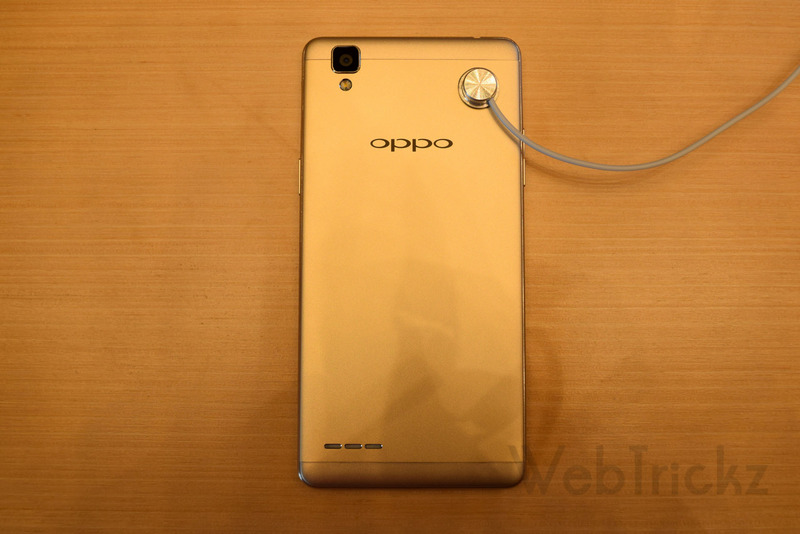 But Oppo emphasizes on the offline channel for sales through its exclusive retail stores and the company is targeting 35,000 sales outlets in India in 2016. 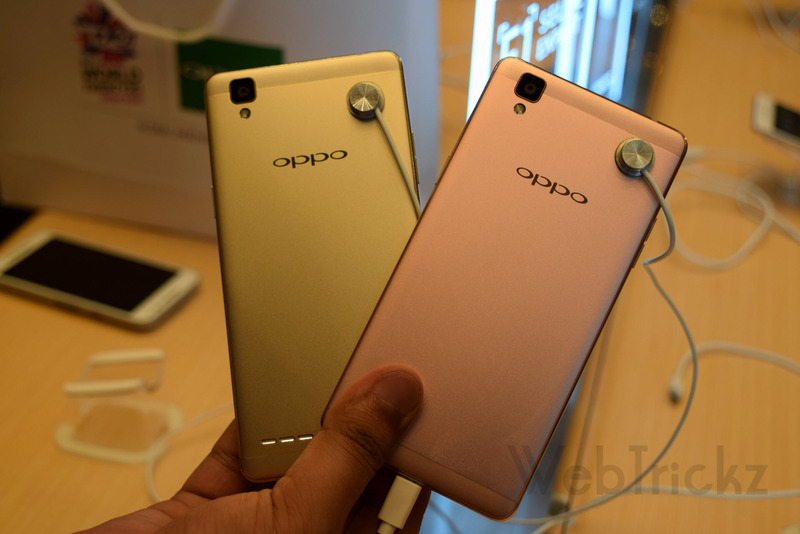 As the F1 is fairly priced at 15,990 INR, we feel it could do well in terms of offline sales and that’s the channel Oppo targets just like Gionee. We look forward to come up with a detailed review of the device covering its technical aspects and overall user experience. Stay tuned!